Up until this point, Marvel: Ultimate Alliance 2 has mostly only shown it's good side, with a few bad seeds strewn in the mix. Now, the spotlight hits a few heavy hitters from the villains side of the board, where Venom and Green Goblin have entered the scene. The developers over at Marvel give us details on their decisions for these two, including the way they look and the way they fight! As you can see, this style of the Green Goblin is not quite like anything we've ever seen before. 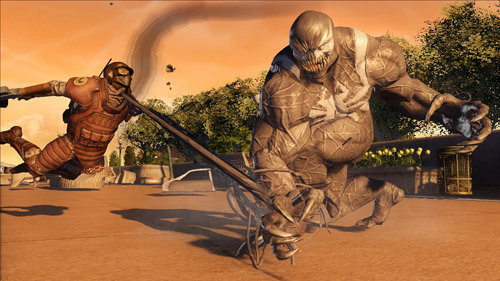 While taking bits and pieces of his design from various reference points, the final product is unique to Marvel: Ultimate Alliance 2. "We wanted something true to the comics, but also something a bit more menacing than what you’d expect for a comic book game. We were trying to get a look that evoked what Marvel was doing with the character: familiar, but unsettling, with an undertone of dangerous unpredictability and malice. Dave Phillips (concept artist) created a beautiful head study which really set the tone for what we were trying to capture." This Goblin is straight out of nightmares. Beautifully designed, we can't wait to see how he moves! Speaking of moves, Green Goblin always had a bit more of a hands-off approach to fighting in the comics, utilizing weapons and explosives to take out Spider-man. The developers acknowledged that, and account for it in the games controls. "For Goblin, we didn’t approach hand-to-hand fighting styles in the same way we did other characters, such as Iron Fist or Deadpool. His glider and assortment of pumpkin bombs separate him from other hand-to-hand fighters. We always thought of him as a squirrelly fighter, delivering quick swipes and painful jabs, but ultimately relying heavily on his arsenal to deliver the pain." By mentioning the glider, they've opened a whole world of possibilities. No other Ultimate Alliance character has had a "vehicle" before, but this glider is in essence a part of what Green Goblin is. Green Goblin will make use of this glider like only he can, we can't wait to see how this one works! "The majority of his powers and fusions use the glider in some way and it makes him really fun to play. One thing that’s great about his fusions is that we weren’t as limited to what the glider could do or where it could go. Goblin hops on his glider and really feels like he’s connected to it and that he has control of it, which was a big concern with the animation. We always wanted to make sure it looks like he is in control of the glider and not the other way around." 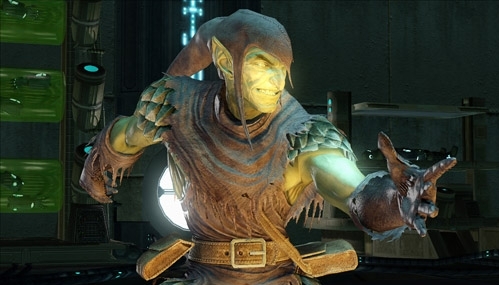 And finally, much like the bug where Deadpool will occasionally fire on allies, the developers made sure to make Goblin feel like his insane self as much as possible. "We also made sure to insert little “personality signatures” wherever we could. We also use a similar philosophy with the moves themselves: One of his Glider attacks was designed with a long “cool-down,” so while his vehicle’s going to work, we used the time to make Goblin cackle maniacally." Check out the full developers blog for additional details on Green Goblin! Venom made a nice appearance in the first Ultimate Alliance title as a downloadable character. There were a lot of amazing things he did, but a few areas he fell short. The developers dish the details on this slimy villain and what makes him tick. We know Venom is a bit of a physical paradox, he's huge, fast, and oddly proportioned, causing interesting challenges for the animation crew. The first thing they mention is his animation style, and the place the inspiration and reference comes from, I couldn't help but be amused! "Gorillas always came to mind when looking at Venom’s form, but jungle cats seemed to inspire me the most. Tigers, leopards… these are large, heavy beasts that still move at incredible speeds and attack quicker than you can blink. We tried to tailor his movements in such a way that evoked those types of lethal behaviors. Venom’s motion had to maintain that mass, while still being smooth, almost exhibiting grace. Where Thing might hurl his body at an opponent or smash the ground, Venom lunges and pounces. Where Thing might clobber some poor sap, Venom will swipe and claw." 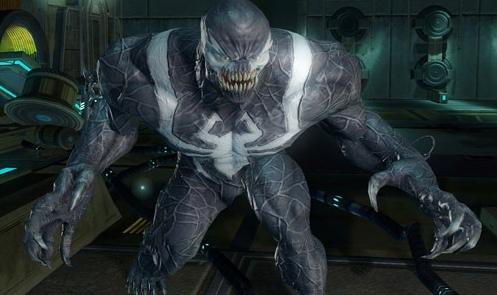 Similar to the way they wanted to boost Green Goblin into being more menacing than usual, they make this particular version of Venom called the "Gargan" Venom. Artistically creepy, with actual eyes and protruding teeth, this Venom fits the "bad guy" bill more than usual. "Right away you’ll notice that Gargan-Venom actually has eyeballs in sockets in addition to those flat, white markings across his head. This tends to make him feel more humanoid. The Brock-Venom has no point of focus for his eyes and therefore feels more alien. It reminds me of that creepy feeling you get looking at arthropods or other creatures with compound eyes. I’ll leave it up to the fans to debate over which is actually creepier." To add to the chills one might feel if they were standing infront of this hulking mass of black goo with teeth, the tendrils that make Venom what he is will be fully intact, and the developers had one more note they wanted to make sure we were aware of. "Lastly, what would Venom be without all of his gooey, stringy tendrils? Well, we’ve got those too. Even just standing around in his idle pose, the effects artists were able to give him animated “feelers” spawning from his body. His tongue is also a formidable weapon in our game, so you’ll be seeing that ugly thing flailing about. Check out the developer blog for more information on Venom!